Handcrafted saddles made in the U.S.A.
A great looker! Top selected quality leather. 3-Plait flat braided sections. Silver conchos and nickeled buckles. 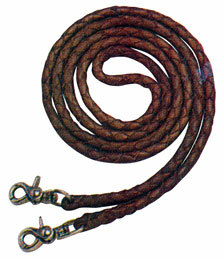 7 Ft. matching flat braided reins. 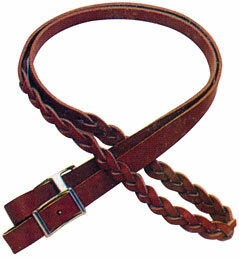 Russet strap leather. Premium leeather and quality crafted. Doubled and stitched. Light, medium, dark oil or black. Horse or Arabian. Please specify. 3-Plait reins, endless braid with Conway adjustments on both ends. 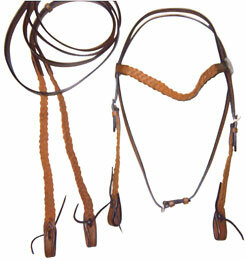 Perfect for contesting, roping, and everyday riding. Tough 8-plait design. 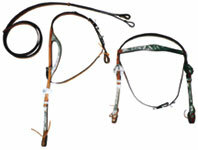 These handsome braided reins are perfect for contesting, roping and everyday riding. Easy-off snap attachments. Made of the finest leather available. 5/8" wide over 6 ft. Doubled and sewn with s dyed edges. Chicago screw ends. Specify color. 6-1/2 ft. long with trigger snaps for easy use. Made with the finest leather available. A stylish, matching set designed for today's rider. 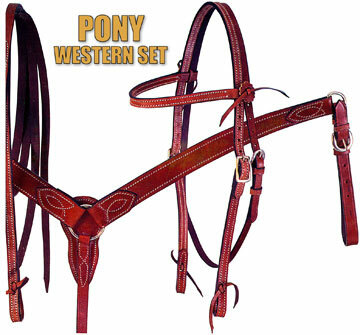 Constructed of fine bridle leather, doubled and stitched throughout for longer wear. 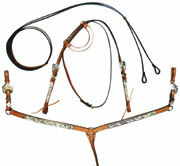 The headstall has double cheek adjustements and tie ends, matching breast collar and stitched reins. Since 1971 a wide selection of our products have been providing todays professionals and pleasure riders with quality equipment and enjoyment.